Clutch has just released Full Fathom Five on vinyl. Full Fathom Five was Clutch’s first ever release on it’s own label Weathermaker Music. Released in 2008, it was originally presented on CD (Audio Field Recordings) and DVD (Video Field Recordings). Now it is being released in a double vinyl gatefold format that includes unreleased bonus tracks from the same live shows that previously did not make the original release the first time around. Clutch continues their Psychic Warfare World Tour 2016. The band will be headlining tour dates in September and October with Zakk Sabbath and Los Angeles based metal band Kyng. Including 2 festival appearances, the trek will begin in Buffalo, NY at the The Town Ballroom on September 28th and conclude in Worcester, MA at The Palladium on October 30th. 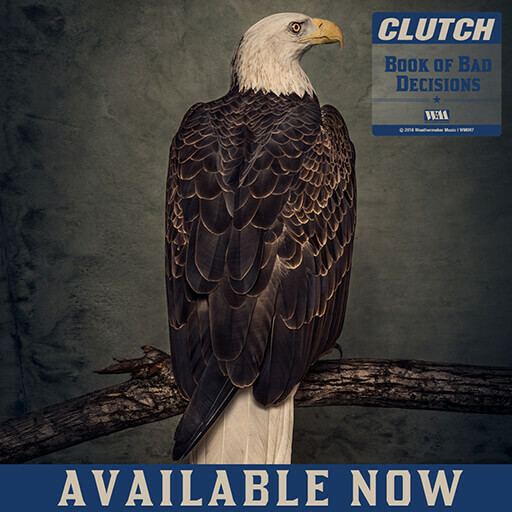 Psychic Warfare is the latest and eleventh studio effort from Clutch. The disc debuted at No. 11 on the Billboard 200, No. 2 on the Billboard Independent, No. 1 on the Billboard Hard Rock and Billboard Rock charts. On Record Store Day this past April 16th Clutch released a limited edition numbered etched vinyl 12 inch that included two previously unreleased tracks from the Psychic Warfare sessions: "Mad Sidewinder" and "Outland Special Clearance”. Psychic Warfare was produced by longtime producer Machine (Lamb Of God, Every Time I Die).